Whilst the kids were up in Michigan, my good friend Jason came up to Chicago and we did the LATE Ride. It was great to see Jason (I don't think we've seen each other in person in 5 years) and it was a pretty chill ride. And I do so enjoy riding around our fair city at 2 am. I mean, in general, and so it's also fun to do it with nine thousand other people. 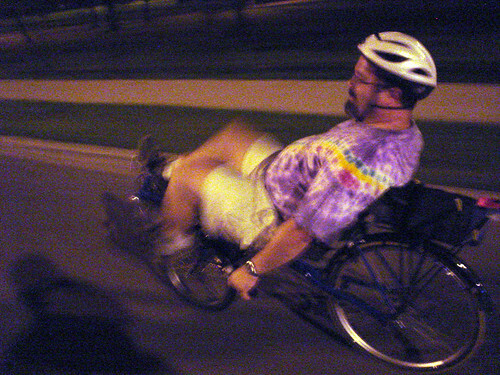 And I rode Jase's recumbent bike for a block and didn't fall over that much. Oh, and hey, we discovered the secret message of Mickey D's.